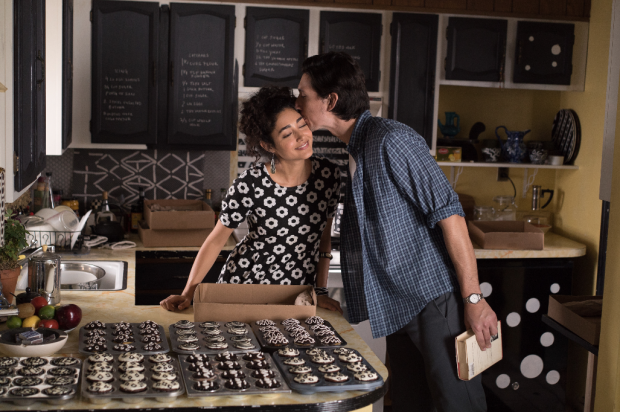 This slight sense of difference from day to day is apparent from the first shot of each day, which at first consists of variation of the same shot of Paterson and his girlfriend Laura (Golshifteh Farahani) as he wakes up, checks his watch, and kisses her as they converse briefly. Significantly, each short conversation creates a sort of resonance; the first one consists of Laura describing a dream she had where the couple had twins. Sure enough, as if in a dream (or at least in a heightened reality, where the film can be reasonably said to take place), twins appear in every single day, and one of the most significant encounters that Paterson has with a one-off character is with a nine-year-old aspiring poet that happens to be a twin. Paterson is built on these moments of chance, also evoked beautifully in random, often comedic conversations that occur between various passengers on Paterson’s bus, but it is also built around a strong supporting cast, especially the regular patrons in the bar that Paterson visits, owned by Doc (Barry Shabaka Henley). Paterson’s day always ends here, in a fade-out to the next day, and there is a sense that his greatest sense of tension is here, as he is stuck in a sort of holding pattern. Still, life goes on for Paterson, and at the end of the day his life is anchored in his poetry, his love, and his adorable if excessively disruptive English bulldog. Both Driver and Farahani possess a similar brand of interiority that manifests itself in endearingly awkward interactions, but there is an undeniable tenderness to their attitudes towards each other and towards their own respective arts. Paterson’s free-verse style (modeled after William Carlos Williams, a former Paterson resident) melds seamlessly with Jarmusch’s more expressive filmmaking, using extensive fades of waterfalls, faces, and landscapes and visualizing Paterson writing the poem as he narrates; there is as much poetry in the way Driver enunciates in starts and stops as in his seemingly trivial but beautiful verses. Laura is an artist too, with an almost never-ending list of dreams and a desire to become a sort of jack-of-all-trades (as long as each trade comes in black-and-white), and though her art isn’t treated quite as seriously as Paterson’s, it is shown with no small amount of kindness and respect nonetheless. Paterson glides by in its two-hour runtime; in a way it is the kind of film that almost feels as if it could have used something like a four-hour length to allow it to breathe a little more. But Jarmusch always remains keenly aware of the slow development of the film, and it is in the final ten minutes or so (after the only truly significant plot development) that it becomes overwhelmingly beautiful, a mysterious encounter with a visiting Japanese man (Masatoshi Nagase) that reinforces Paterson’s art with a sense of heritage that had only been hinted at before. Paterson is in more than a few respects a dense film, but it also remains purely pleasurable, at ease in so many modes and types of communication.